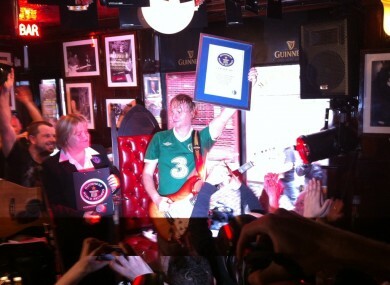 Dave Browne became a true guitar hero when he broke the Guinness World Record for the most time playing a guitar this morning. The moment the world record was broken. AN IRISH GUITARIST has this morning broken the Guinness World Record for the most time spent playing a guitar, reaching a remarkable 114 hours and 20 minutes of playing. Dave Browne smashed the previous record of 113 hours that was set last year after he played a total of 1372 pieces of music. He began his task on Sunday at 4pm at The Temple Bar pub in Dublin with Twitter and Facebook closely following his progress. It was at 10.20am today that Browne broke the record. His feat is made even more remarkable given that it emerged after 90 hours of playing that the world record was not 100 hours as had been reported but in fact 113 hours, meaning that Browne had to carry on playing that bit longer. I am absolutely ecstatic. It feels surreal. I have to say I am incredibly lucky to have had such great support from friends, family and fellow musicians and visitors to the pub as they really kept me going. Browne, who has played with the likes of The Commitments, The Dubliners, Aslan and the Pogues, was at various points in the marathon session joined by friends and fellow musicians as he made his world-record attempt. Those who jammed with him included Colm Ó Snodaigh from Kíla, Nick Kelly of The Fat Lady Sings as well as a host of other acts from the Temple Bar and Irish music scene. He had been been in training for the past nine weeks, losing over two stone in weight, consuming 2,000 calories a day and building up to a 56 hour session playing guitar throughout that time.He had said that the hardest challenge would be staying awake. In accordance with the rules Browne had a 30 second break between songs - which had to be recognisable, published music lasting at least two minutes – and built up to a 40 minute break every eight hours. In this time he would power nap, eat a protein meal, shower and change. On Wednesday he got a chance to play a rare limited edition, signed Stevie Ray Vaughan Fender Stratocaster electric guitar. “It was an amazing experience,” Browne added of the whole record-breaking event. Email “Irish guitar hero smashes world record after 114 hours of jamming”. Feedback on “Irish guitar hero smashes world record after 114 hours of jamming”.